Enter our giveaway of the new Pipedreams CD, signed by Michael Barone. 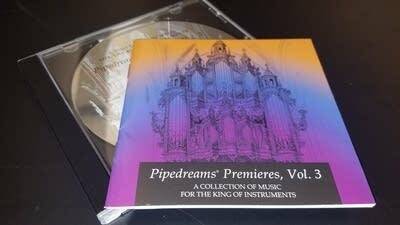 Pipedreams Premieres, Vol. 3, contains Henry Martin's Preludes and Fugues for Organ, Nos. 1-12, along with his program notes and an introduction by Michael. Enter below for a chance to win. A winner will be drawn randomly each week until each CD has been given away. You can enter for a chance to win a copy of the new Pipedreams CD. Winners will be drawn at random each Monday at 9 a.m. central until each CD has been given away. Subscribe me to the Pipedreams newsletter to keep up with the best in organ music.